If it was “keep your eye on the malt ball,” I would never lose track. 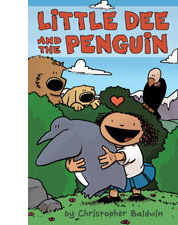 I received a really nice review of “Little Dee and the Penguin” from comic blogger and long-time reader Gary Tyrrell. Although it is very kind and positive about the book, it does talk quite intelligently and deeply on the subject of the sometimes-difficult transition (for a reader) from an original work and what it becomes when it is re-created for a different medium. And another lovely review of “Little Dee and the Penguin” by Coan Tigard. Do you know anyone who has a book review blog and needs a copy? Let me know! Do you know anyone who has a book review blog and needs a copy? OOH! Yeah! Yeah! ME! Memememe!